One of the many unexpected gifts of taking time off from parish ministry has been spending Holy Week with my children. It’s taken me a few years to see this as a blessing, though! When my children were in preschool, a huge snowstorm kept them both out of school for a week – the same week my husband Eric (also a priest) left for a four-day silent retreat to prepare himself for Holy Week at his parish. All my go-to snow-day parenting tricks were used up early in the week and I was close to entering panic mode. Then, as I was drinking my (second? third?) cup of coffee, I glanced over at the Forward Movement “Journey Through Lent” calendar taped to our fridge and gained some needed perspective. Even though we had colored it, we somehow skipped naming our blessings. The kids and I immediately started a list. One child would come sit with me as I typed up their list of thanksgivings while the other played in the living room. We alternated back and forth all morning long naming the most heartfelt, authentic blessings that a 3 and 5 year old could name: My bed, my own room, my daddy who plays with me, my mommy who cooks with me, my dog who lays with me, my brother who shares with me, my loveys, waffles, bubble baths, creativity, school, grandparents, godparents, so many loving aunts, FaceTime, the library, our church family, dance music and sleepy music, Jesus, laughter, forever friends, cuddly pajamas. Naming these blessings was such a simple act, but it profoundly centered me in a way that allowed me to look toward parenting during Holy Week with excitement rather than distress. The idea of washing another person’s feet appeals to many children. My son was so eager to try it that he personally invited every member of his pre-k class to join him. I’ve experienced countless holy moments during Maundy Thursday liturgies – from stripping the altar with my mother as a teenager, to weeping as a priest while a church matriarch scrubbed the stripped altar. Still, watching a grown parishioner wash my five-year-old’s feet, then watching that same five-year-old wash his father’s feet remains the most sacred Maundy Thursday of my life. We held hands as the altar was stripped bare and then chanted “Stay Here with Me, Remain Here with Me” all the way home from church. Maundy Thursday foot washing services are exceptionally appropriate services for children to attend. The following year when my son was in kindergarten we added a new element to our Holy Week observances: The Holy Week Lego Challenge, adapted from the Proverbial Homemaker’s Easter Story Brick Challenge. For the past two years, I’ve read an assigned Bible story each day of Holy Week, then my son creates the story with his Legos. While he’s building we often talk through the story, answering questions and making connections to our lives today. 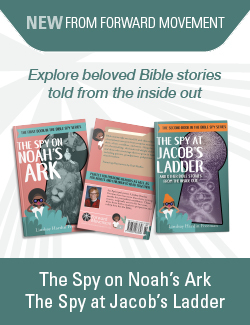 We tend to read multiple versions of the stories from our various children’s Bibles. On some days we use a NRSV Bible because children’s Bibles omit the story altogether. I cannot wait for my daughter to join the fun this year. This Lent I set my weekday alarm fifteen minutes earlier than usual so I can prepare lunches and unload the dishwasher before the rest of the house awakes which allows me time to sit with my children as they eat breakfast. 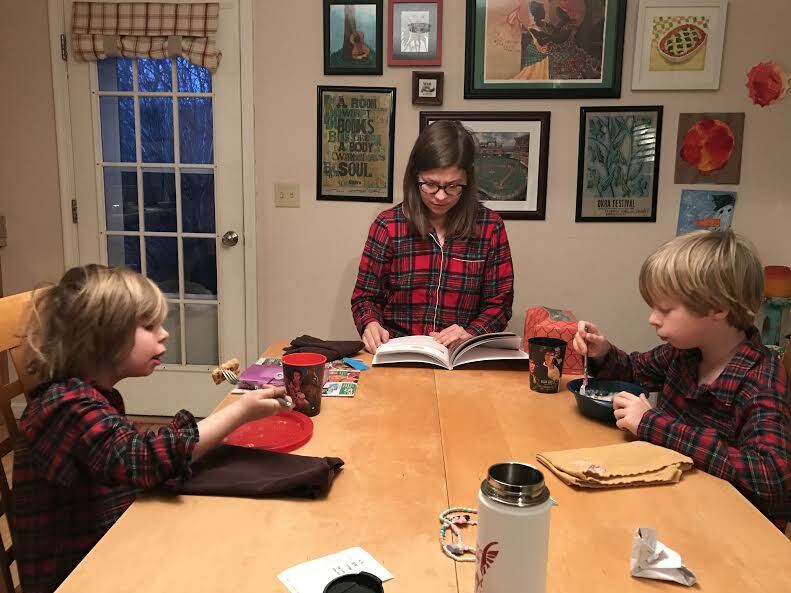 While they eat their cereal, I read a chapter of The Path, a family storybook bible from Forward Movement co-written by my son’s godmother. Starting with the story of creation, we are journeying our way through the Bible every morning before heading off to school and work. Reading the Bible in order allows them the opportunity to connect themes that often go unnoticed when reading stories at random. My favorite part are the thoughtful questions posed at the end of each chapter. I ask some aloud and others I write on slips of paper to tuck into their lunchboxes so they might continue to reflect on the story as the day progresses. From picture books to Lego challenges to reading The Path, my hope is always that these activities will deepen the kids’ Holy Week experiences. They will hear the voice of the prophets as we wave palm branches on Palm Sunday. They will remember Peter protesting Jesus’ offer to wash his feet as they submerge their own in a bowl of water on Maundy Thursday. They will recall Mary’s jubilant song of bearing the Christ Child as we walk the Stations of the Cross on Good Friday. And Easter morning will be a day of immense celebration over not eggs scattered on the church lawn, but the empty tomb as well. 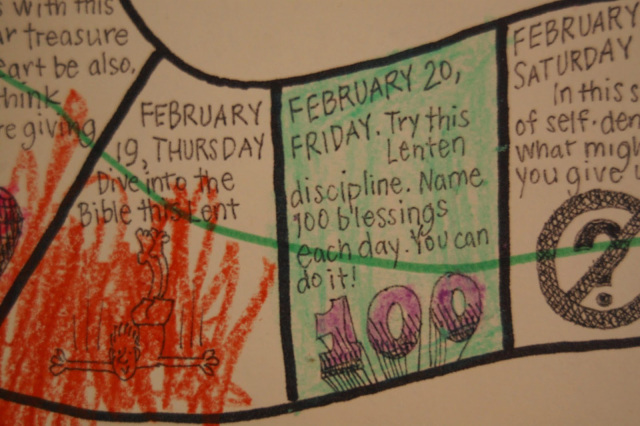 There are numerous opportunities and ways to involve even the youngest children in Holy Week. How will it look for your family?